I totally lived on peanut butter growing up. I would forsake any other meal for a peanut butter and jelly sandwich. I slathered peanut butter on everything. When I say everything, I mean everything. I could never get enough of the stuff, and I still eat it almost every day. However, with all of that peanut butter eating, a popular trend escaped me… the peanut butter and honey combo. Suddenly within the last year or so, I’ve heard of folks eating peanut butter and honey sandwiches. I’ve seen jars of honey peanut butter show up at the grocery store. Pictures of honey-peanut butter ice cream have popped up on Pinterest. I might be late hopping on this train, but I couldn’t let honey-peanut butter cookies pass me by. 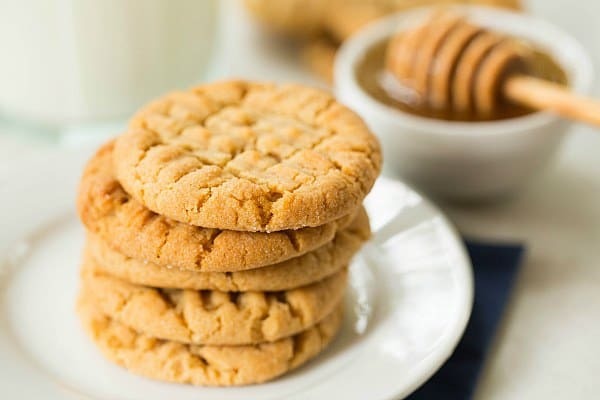 I’ve made quite a few different peanut butter cookies in my day, and these rank right up there at the top with my favorites. The honey flavor is subtle, hitting you just as you finish chewing and lingering a bit on the tongue. 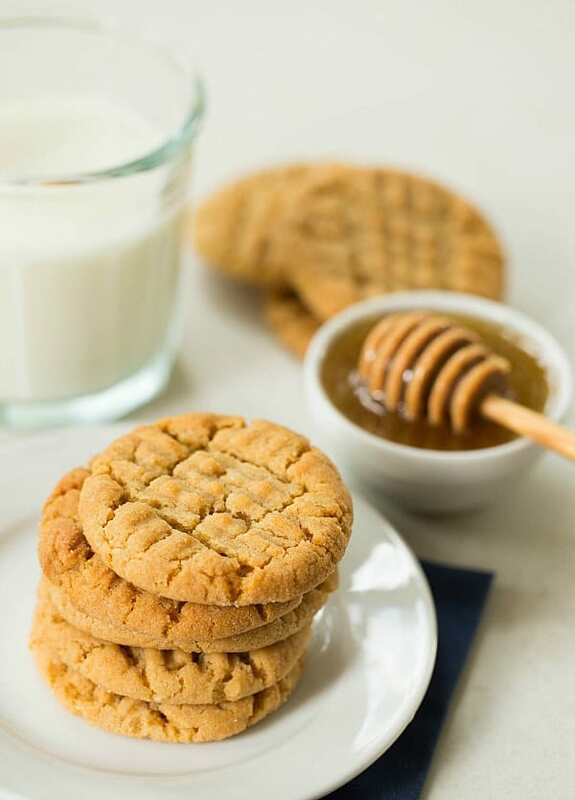 Once I made at ate these, I realized how silly it was that I never got the connection between peanut butter and honey. Hello! Honey-roasted peanuts! Doh! My grandma always kept a jar of honey-roasted peanut in her pantry when I was a kid, and I just could not help myself. If allowed, I would have eaten that entire jar in one day. Now that the combination of peanut butter and honey is in my life, I’m not letting it go. Grape jelly will always be my first love, but a girl can have room in her heart for more than one pb love, right?! 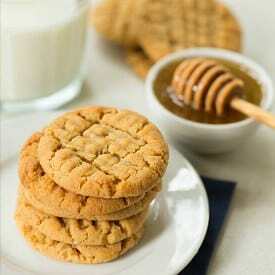 A recipe for Honey-Peanut Butter Cookies; tastes just like honey roasted peanuts! In a medium bowl, whisk together the flour, sugar, baking soda, baking powder and salt; set aside. 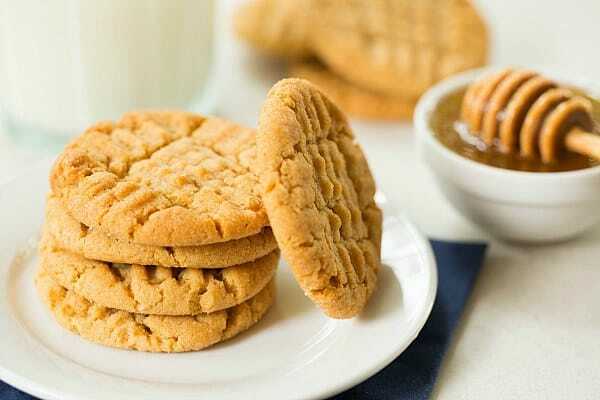 In the bowl of an electric mixer, cream together the peanut butter, honey and shortening on medium speed until light and fluffy, about 3 minutes. Add the egg and vanilla and mix until combined. Reduce the mixer speed to low and gradually add the dry ingredients, mixing until just combined. Give the mixture a final stir with a rubber spatula to ensure all of the flour has been incorporated. Use a medium cookie scoop (about 2 tablespoons of dough) to scoop out dough and roll into a ball between the palms of your hands. Roll in the sugar and place on the prepared baking sheets about two inches apart. Using fork tines, press a criss-cross pattern into the tops of the cookies, flattening them into disks. Bake until lightly golden brown, about 10 to 12 minutes. 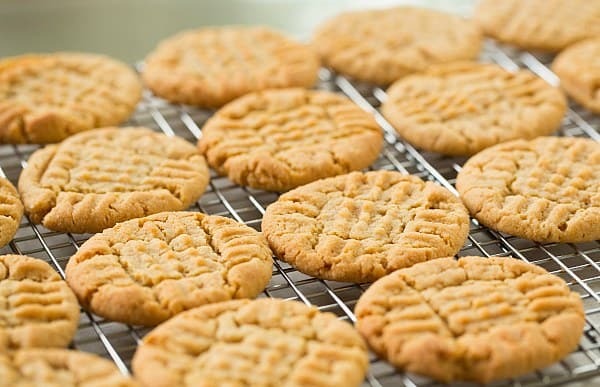 Allow the cookies to cool on the baking sheet for 5 minutes, then use a spatula to remove them to a wire rack to cool completely. The cookies can be stored in an airtight container at room temperature for up to 5 days. These cookies came out perfect and tasted great! Great recipe. Using butter instead of shortening? Similar enough result or you’ve tried and not as good? Hi Janette, Not similar at all – they will spread too much with butter. Enjoy! I know this was posted a long time ago but I just found it while doing a search for honey peanut butter cookies. I made a few modifications, partly for preference and partly to use what I had on hand, and they came out great! I used white whole wheat flour (didn’t have all purpose flour), subbed half butter and half coconut oil (2 T ea) for the shortening (again, didn’t have shortening), then subbed half organic cane sugar and half brown sugar (2 T ea) for the 1/4 of sugar (preference and to help with texture since I didn’t use shortening). They came out FABULOUS! If anything, they were a little too sweet for my taste, so when I make them again I will experiment with reducing the sugar and/or honey a bit. But I’m not getting any complaints with them just as they are. Thanks for the recipe! A very easy (and delicious) recipe for a timid baker such as myself to follow. I made them at 2:00am so my special gentleman companion would have a nice surprise when he wakes up for work at 5:00am. Thanks for posting. Is it okay to skip out on the sugar entirely? Hi Mia, No, it will affect the texture of the final cookie. These were amazing. I just made them tonight. And the kids enjoyed them as well, seeing as it took me longer to make the cookie dough than it took them to demolish the cookies. Lol.